There was a great deal of excitement, understandably so, around Disney’s announcement of a new princess, Elena of Avalor, this week. 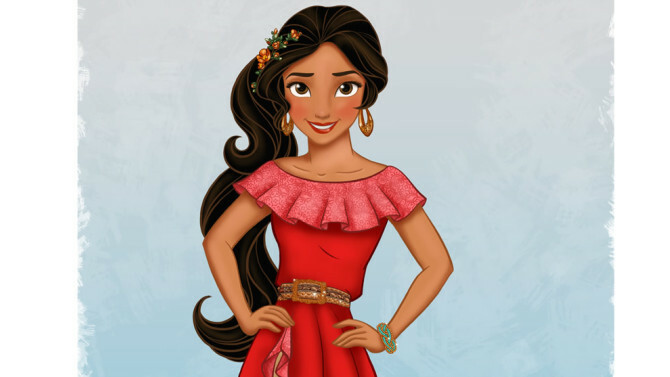 An olive-skinned, gorgeous babe who looks like she goes to Jasmine’s same hair salon to get blow-outs, Elena was widely celebrated in the media because, well, it’s crazy that there still hasn’t been a Latina royal in the Disney family. Cue the collective gasp at the fact that she is another “counterfeit” Latina. As someone living in 2015, I know a lot of Latinas “of mixed heritage.” Some of them look like Christina Aguilera. Some of them look like Zoe Saldana, and some of them look like Elena of Avalor. My point is that this notion of a fully legitimate vs counterfeit Latina is flawed, just like trying to be all things to all Latinos is, at best, an illusion, and at worst, and impossibility. Unlike Disney’s first black princess, Tiana from “Princess and the Frog,” (whom I love), when it comes to a Latina princess, we are not just talking about race, we are also talking about ethnicity and nationality and all the idiosyncrasies therein. You can’t tell me that a Mexican princess would be 100% relatable to a Puerto Rican girl in the Bronx. And she shouldn’t have to be. So inevitably you run into trouble when attempting to group this wide spectrum under the same umbrella, when really the only clear, tangible, unequivocal unifier is language. And even then you have Latinos who are Spanish-dominant, bilingual, and English-only. So what does unify the Latino sub-cultures, besides language? It’s the intangibles, things that can’t easily be depicted in a literal way, such as work ethic, nostalgia for where you came from, the importance of family, a sense of community, the appreciation for rhythm, the passion for life, to name a few. Those, too, are generalizations, but in my thirty-some years on this earth, having traveled a bit and met Latinos from all walks of life, there’s something of a common denominator there. So what am I saying here? The need for diverse images of beauty and regality is unquestionable; when I was growing up, all I had to play with were thin, fair-skinned, blonde and blue-eyed Barbies and Kens. But my parents also instilled imagination in me, so I made those dolls whatever I wanted them to be, I made them relatable. I made a few of them speak Spanish. Thankfully, my kids will have more options. But let’s not fool ourselves into thinking that a single princess — Sofia, Elena, or the next one they come up with — can represent the full complexity and range of being a Latina. In Elena’s case, the way she looks or whether she is technically from a land inspired by Spain, or South America, is less important to me than her backstory and what she teaches young girls about character. Still, as great as it is to have these depictions, that can’t be all we offer our kids. If you expect a corporation — however child-oriented that corporation may be — to define the way your child looks at herself and her place in the world, you will be repeatedly let down. We should, to the extent that we can, hold the people making these decisions responsible, but I also think that that accountability starts at home. This coming from a woman who played a strong, intelligent, fiercely loyal blue princess in a fictional world in the highest grossing movie of all time. This story was originally published in Variety Latino.